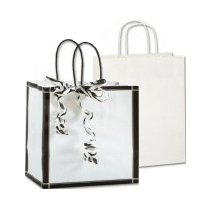 Our line of paper shopping bags offers retailers a wide selection of styles and designs. Custom printing available as well. 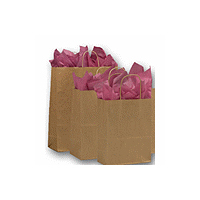 Find a large selection of Kraft paper shopping bags, in many sizes and an assortment of colors. Wholesale pricing for retail store owners and customers. Our complete line of classic European shopping bags offers retail shops an affordable way to have very elegant looking shoppers. You will find beautiful white shoppers in a variety of styles including euro-totes, white Kraft paper bags in this collection. Hot stamping available. 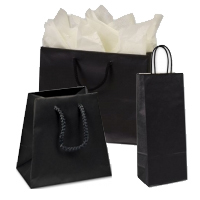 Retail black shopping bags can be ordered in bulk to save money. These beautiful yet sturdy shoppers can help your retail brand be memorable. 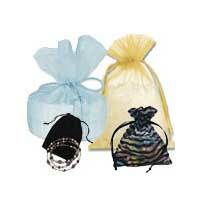 Velveteen drawstring bags are just the right size for jewelry gifts, little gift soaps, perfume samples and much more. Bags come in 100 per pack. Fun paw prints, zebra prints and leopard prints make our animal shoppers attractive. Let your customers feel the fun of buying from your retail store. 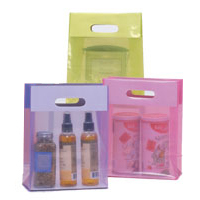 Display your food treats like candy, nuts, cookies, soaps or anything you choose in these colorful and fun bags. 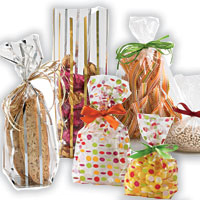 Whether you own a gourmet bakery or make food from your own kitchen, these specialty food bags can hold any type of yummy products. You'll find some adorable wine bags that people have made themselves. Pinterest fans will love seeing these gift bags. Enjoy browsing today. Use these fun bags and totes for little gifts that will make your guests feel special. They will remember your lovely event each time they see your cute little tote bag. 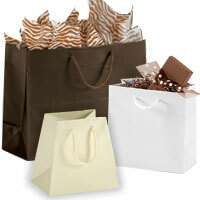 Fabric gift bags come in many colors as well as fabrics. One of our most popular bags, the black velvet pouch, holds jewelry items with style. 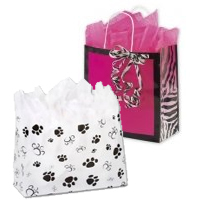 Organdy bags with drawstrings make fun party favor or wedding favor bags. Use for any kind of special little treat for your customers. 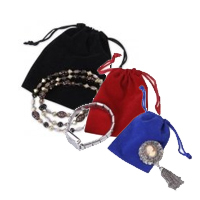 Velveteen jewelry pouches can hold jewelry, gems and other fun treasures. 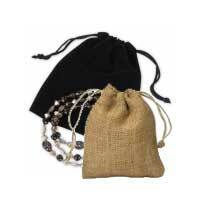 Our wholesale drawstring pouch collection includes muslin, burlap, cloth and organza fabric. 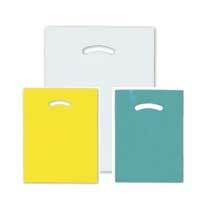 Die-Cut Handle Plastic bags come in a large variety of colors. Advertise your company name right on your bags. Wholesale prices make these a great buy. Send your customers home with your products in a small t-shirt bag. Holds up to 20 pounds! Wholesale pricing for retailers. bPaper merchandise sags come in a variety of materials and colors. 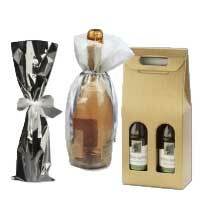 The kraft paper merchandise bags are light weight and inexpensive. They look classy and perfect for your smaller products. 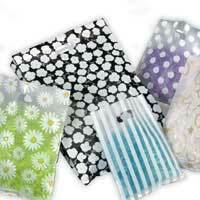 Plastic Merchandise Bags at wholesale prices. 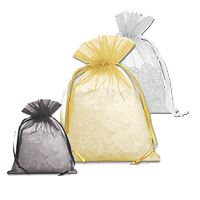 Choose from low density bags or high density bags. 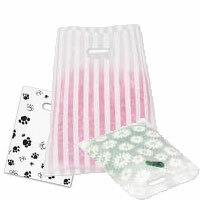 Die-cut bags can be used for almost anything from dental bags to product bags. 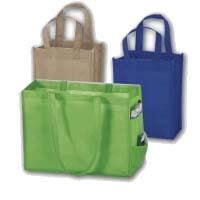 Eco-friendly reusable tote bags can be used for groceries, conferences and company advertising. 100 bags per case. These reusable shopping bags are available in the season's trendiest colors. By using these bags at the grocery store, you are helping to save the planet. 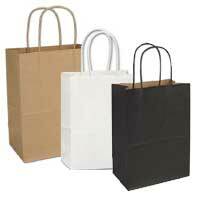 Retail paper shopping bags are available in a variety of colors and designs. Submit your business logo to be printed on our retail shopping bags and watch your business brand awareness grow. If you are looking for retail bags at wholesale prices, you've found the right site. Bows N Bags offer you wholesale pricing on high quality, elegant and beautiful retail shopping bags that can be used for a variety of purposes. 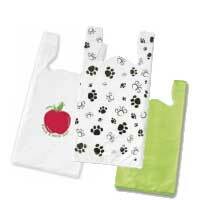 Bags are made of paper, plastic and reusable fabric and come with handy carry handles. We have got you covered for your next retail sale or special event. Don't have your own logo? Great. Our custom design team can work with you and design a beautiful logo that reflects your unique business. Then we take that design and hot stamp it on your professional custom shoppers. 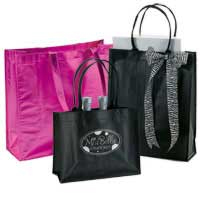 Our merchandise bags can be ordered in a variety of styles from the Kraft shoppers to the simply elegant Euro-Shoppers. 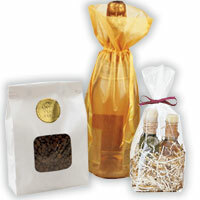 Our fabric bags offer you yet another choice in packaging your gifts. Just pull the string and your gift is wrapped! The same quality goes into our cello bags, gourmet food bags and bags that can be recycled. Our supply of Plastic T-shirt bags can meet many of your packaging needs for smaller items. We've got your merchandising needs covered in style and design. We also carry an exceptional line of tissue paper. Glitter tissue paper, sold at wholesale prices can add sparkle to your shopping bags. Order today.